Cheers supporting the removal of the Sheridan expressway rang out during a mile-long march from Hunts Point to a community meeting last night about the future of the Robert Moses-era highway, as roughly forty protestors chanted, clapped and whistled while parading down Southern Boulevard. The same cheers broke out early in the meeting when three-quarters of the participants walked out in protest. The event was the first public forum since the city declared that it had ruled out removing the Sheridan before completing the full teardown study. Residents and community leaders wanted the opportunity to make their case for putting a teardown back on the table. The Department of City Planning facilitators, however, refused to discuss the issue, saying that no city staff at the meeting were empowered to touch the topic that was supposed to be at the heart of the planning process. 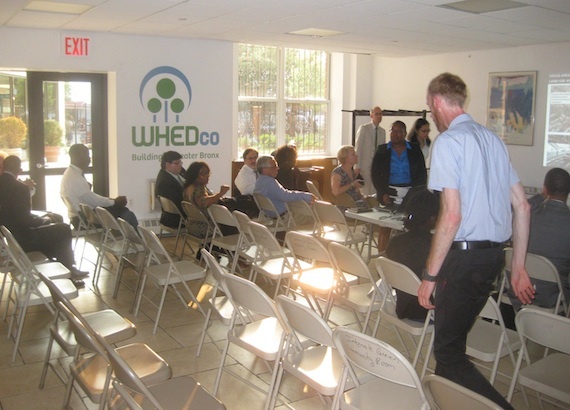 When they resumed their conversation about small-bore improvements to the neighborhoods surrounding the highway, it was to a room of mostly empty chairs. The Bloomberg administration halted the study of the Sheridan teardown last month, declaring that the plan had a “fatal flaw”: more truck traffic on local streets. But the traffic analysis seems to have been killed before it ever really got going as a result of political pressure from distributors at the Hunts Point Produce Market. The analysis failed to look at ways to mitigate truck traffic, such as making it easier to turn from the George Washington Bridge to the Major Deegan. Rather than study how a teardown would affect trip choices, the city simply assumed that each and every trip taken on the Sheridan would continue to be made after the highway was removed. Speaking on behalf of Congressman José Serrano, Anna Vincenty called the results “premature and not in keeping with the aims of a full study.” Serrano helped secure the TIGER grant that funded the Sheridan study, which was expected to examine a teardown in greater detail than the state DOT had previously been willing to do. “Our borough deserves a fair shot at reclaiming the land under the Sheridan,” said Vincenty. In the meeting, Department of City Planning staff members, who are coordinating the study of the area, attempted to stay on the scheduled topic for the meeting — land use — and rebuff residents’ demands for a chance to revisit the Sheridan teardown decision. “There are actual opportunities to create change,” said Tawkiyah Jordan, the Sheridan study project manager. But residents weren’t willing to let 11 years of activism for a Sheridan removal go for nought, nor did they accept a conversation that didn’t include the teardown. “I don’t own the Hunts Point Market,” said one meeting attendee. “If I did, or if I was a millionaire, this would be a different discussion.” After being told that the Sheridan wouldn’t be up for conversation during that meeting, most of the audience marched out. The land use improvements that DCP went over after the walk-out seemed positive, but their small scale only underscored what’s at stake with the highway removal. Sprucing up the dark and dirty 174th Street Bridge, which provides one of the only access points across the Sheridan to the new Starlight Park on the Bronx River waterfront, is one thing. 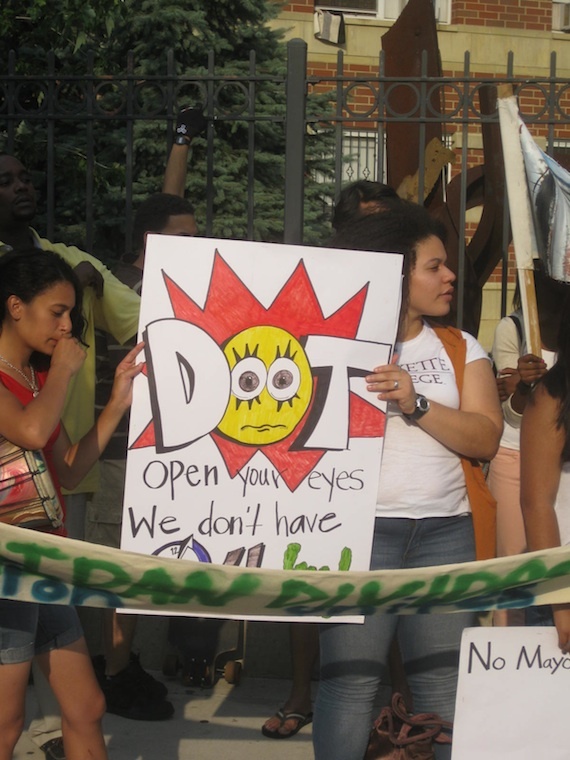 Letting Crotona Park East residents walk directly to the water is another. Jordan herself admitted that what happens with the Sheridan “will directly affect what you can do” with waterfront access. The same is true for a number of goals Jordan said had been identified during the planning process, such as adding new open space, improving pedestrian access and safety, finding room for new schools and adding housing and retail near the Whitlock Avenue subway station. Other changes still under consideration include creating small decks on top of the Sheridan where Westchester Avenue crosses over it. The decks could support the construction of wider sidewalks and some small retail along the bridge. “We understand that improvements to the pedestrian realm must be made, no matter what,” said Jordan. Since the Sheridan itself was not under discussion last night, no details were provided on what might happen to the roadway itself under a “modify” scenario, which could conceivably include a wide range of options to mitigate the impact of the highway. Hmmm. I guess favorite son Bloomberg isn’t perfect. But of course, it’s also his police department stonewalling on information, investigations and enforcement of street safety. What a shock. Perhaps you can explain how it would improve pedestrian safety by routing the trucks via West Farms Road, where they would cross several more intersections, including the one between the subway station and the neighborhood? The deck at Westechester Avenue is an excellent idea. Why no consideration of building ATOP the northern portion of the Sheridan, keeping it, but having the development of a line of buildings as sought withthe waterfront park- would be a win win but is overlooked. 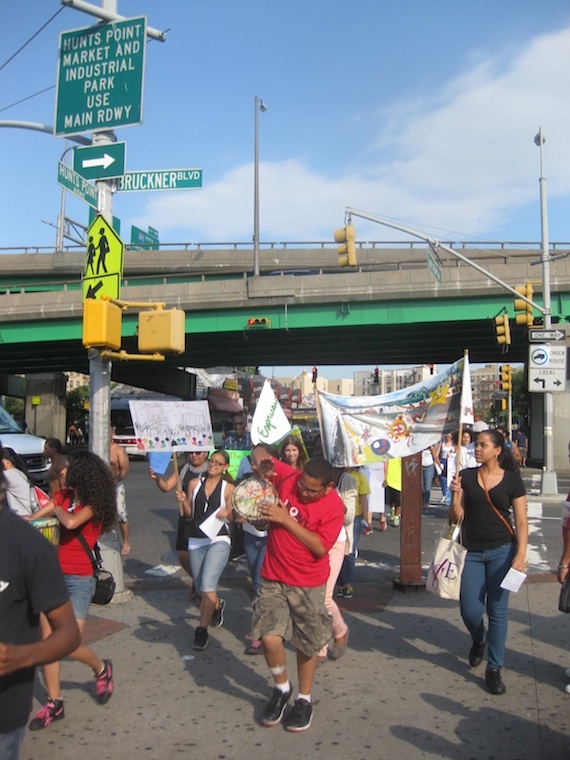 South Bronx advocates are raising the alarm about the Cuomo administration's plans for the Sheridan Expressway, saying the state DOT is rushing ahead with a project that ignores years of advocacy for safer neighborhood streets with less truck traffic.